The Spirit of Giving: Original Art for the Holidays! The CBLDF has reached deep into our vault of incredible original art to bring the best gifts for the comic fan and original art collector in your life in The Spirit of Giving: CBLDF Holiday Auction! A tremendous array of work is available now ranging from pieces by legendary superstars including Neal Adams, Walt Simonson, and Matt Wagner to some of the hottest talents working today, such as Francis Manapul, Amanda Conner, Chris Burnham, and more! 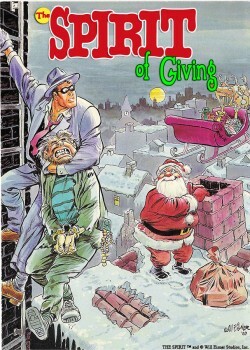 The The Spirit of Giving: CBLDF Holiday Auction is designed to make shopping easy for anyone looking for comic art for gifts or otherwise. Items range from small sketches to finished work, from pencil roughs to fully painted and lettered sketches. With the wide variety of styles and subjects in this auction set, comic fans and collectors will certainly find an amazing piece of original art that is perfect for them! This is a great way to support the Comic Book Legal Defense Fund this holiday season and come away with an incredible piece of art! Check out the auction here.